Walk-in-Interview for the position of Junior Research Fellow (JRF)/Project Fellow in National Medicinal Plant Board (NMPB), Govt. of India, Ministry of Ayush, funded project Name of the project: "Antagonistic activity of Pongamia pinnata against quorum signal molecule(s) produced by a marine bacterium"
Duration of project: Three Years. The appointment will be on temporary basis for a period of one year. Based on performance in the first year, the appointment could be extended till the end of project. The position will be co-terminus with the project. Essential Qualification: M. Tech. (Bioprocess engineering and Biotechnology) or M.Sc. (Life Sciences) with at least 55% marks in aggregate or equivalent CGPA. Desirable qualification: Candidates having evidenced experience in terms of publications in Protein Purification/ Microbiology/Molecular Biology/ recombinant DNA Technology and candidates with UGC, CSIR, DBT (JRF/NET/GATE) will be given the preference. Dr. Kodali Vidya Prabhakar, Assistant Professor, Dept. 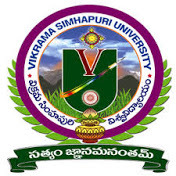 of Biotechnology, Vikrama Simhapuri University, Nellore-524 320, AP, INDIA. Email: kodalividyaprabhakar@gmail.com; Phone: 08612352365; Mobile:9948745927.